Pandorea jasminoides, variously known as Bower of Beauty, Bower Vine or Bower Climber. This member of the Bignoniaceae family is a very vigorous woody climber. Glossy dark green leaves are mostly opposite or in whorls of three and 12 to 20 cm long. Each leaf consists of 4 to 7 leaflets with lanceolate to ovate leaves. 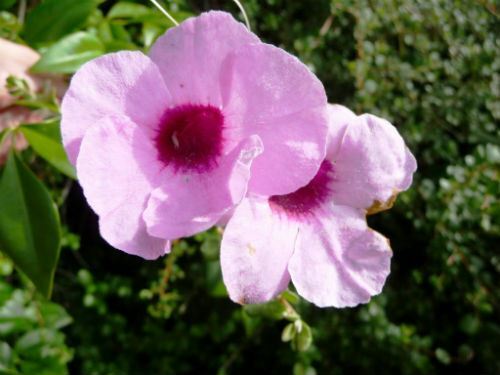 Flowers are white or pale pink, trumpet shaped and up to six centimetres long. Blooms are carried in clusters from spring to summer. The vines are covered with flowers during the flowering season. Boat shaped pods follow the flowers and contain numerous winged seeds. We have P. jasminoides growing against the north-facing wall of a shed and on the supports of our patio roof. Although the species comes from the warmer areas of Queensland and northern NSW our vines survive, thrive and bloom bounteously in our cold climate garden. There are a number of cultivars including “Lady Di” with snowy white flowers and yellow throats and “Southern Belle” with dark pink flowers. Please note: Pandoreas develop a strong and penetrating root system and should not be planted near underground pipelines. Propagate from fresh seed and stems cuttings.